Fatal Bicycle Accident | Flickr - Photo Sharing! Walking home from the Film Makers Forum, there were six police cars blocking the street ahead. 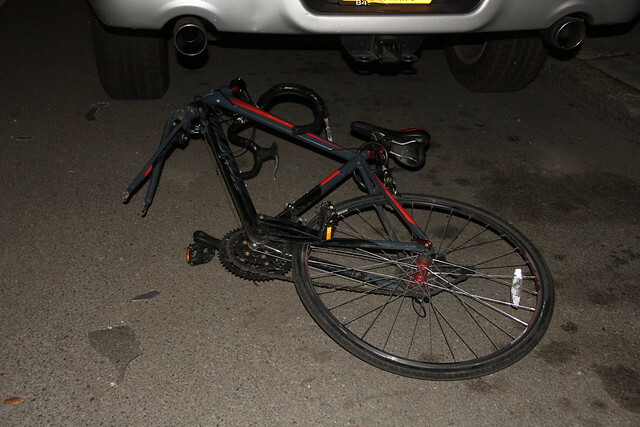 This bike had come to a rest under the bumper of a truck from New York that was parked on the street. The front bike tire was up next to the mural on the sidewalk. The front fork on the bike is bent... bits of a head light are lying on the street. I'm not sure the story behind it and I have not seen anything about it on any of the local news papers. As always with something like this, please practice patience and responsible driving and bike riding. This goes especially for bikes: be predictable. Wear a helmet. Use front and rear lights. Keep in mind regardless of where the fault lies, the bicycle is always on the losing end. Papers now indicate Corey Frazier, the cyclist, died of his injuries later on Sunday. When I reflect upon walking up to this fatal accident, I remember looking at his bicycle lock and thinking of how carefully his hands locked and unlocked it each time he went out for a ride. The lock was just ready there for its next use.